Tu B’Shevat marks the ‘new year’ for trees. This might not be the best-known of the Jewish holidays, but it’s one that I always remember. 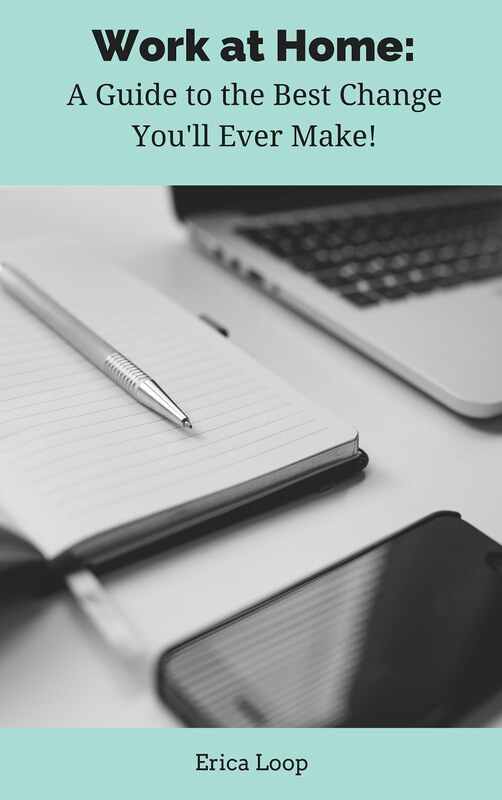 (This post includes affiliate links. For more information please see my disclosure statement). Every year we got to ‘plant’ trees in Israel. By plant, I mean we filled out a form, made a donation and a tree was planted in our names. I remember daydreaming about visiting my mini field of trees – that never happened. But, in celebration of Tu B’Shevat your child can grow her own forest. Ok, not really. But, she can make her own trees out of modeling clay and ‘plant’ them in some more clay. 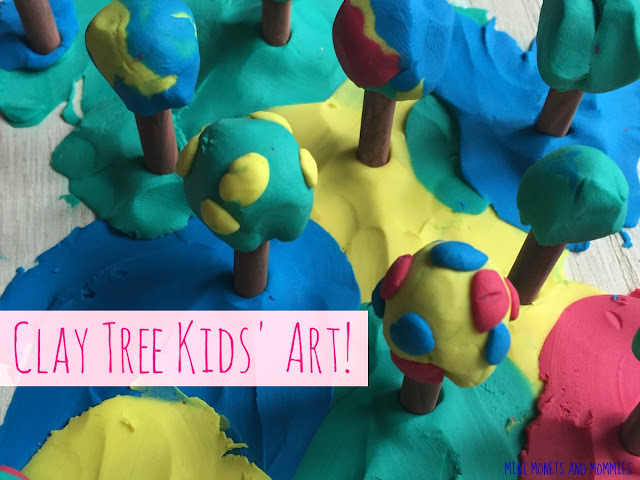 Your child can sculpt a grove of flowering trees, fruit trees or imaginative make-believe trees that have wild colors, bold patterns and swirls of hues. This also provides you with an opportunity to talk to your child about plant science and the growing cycle. Ask her where trees come from and what they need to grow. We have somewhat of a stockpile of broken boards at our house (a side effect of seven years of karate). Instead of letting them pile up in the basement, I like to use them for art activities. For this one, we reused a board as the forest floor base. If you don’t have a board, don’t worry. You can use thick cardboard instead (e.g., the side of an old moving box). 1. Paint the pegs. Your child can paint a realistic-looking brown trunk or opt for something colorful and out-of-the-ordinary. Let the paint dry completely. 2. 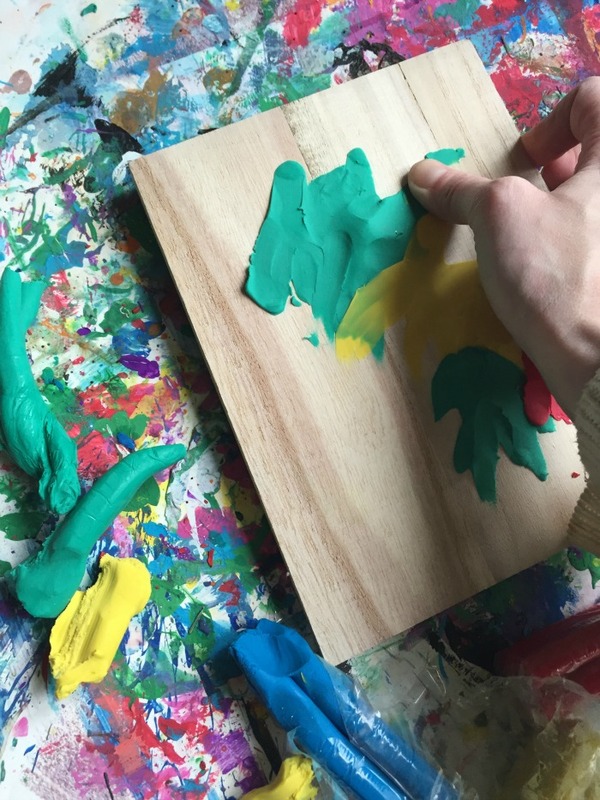 Finger paint the board with clay. Tear apart dime-sized pieces of clay and spread it (like finger painting) across the surface. It will stick. 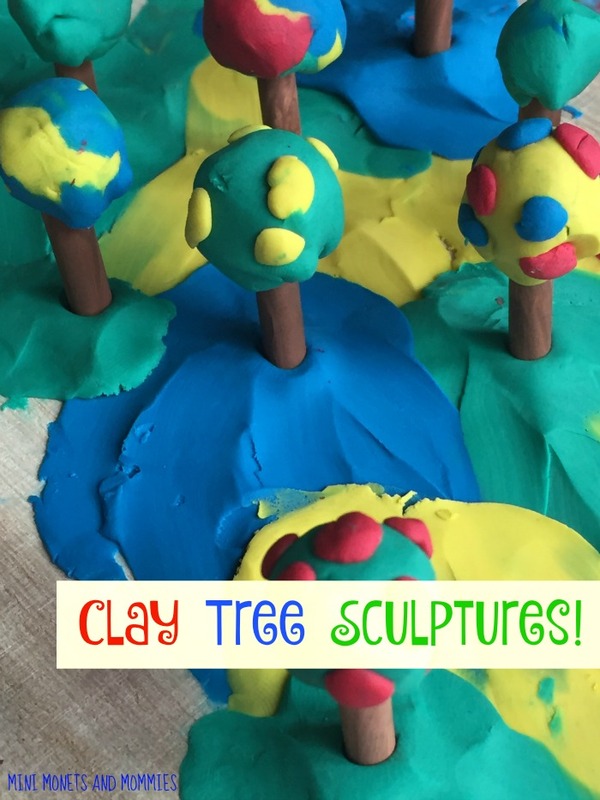 Make hills or mounds with the clay to push the peg trees through. Your child can create a topographical type of ‘map’ on the wood or make an imaginary area in a rainbow of colors. 3. 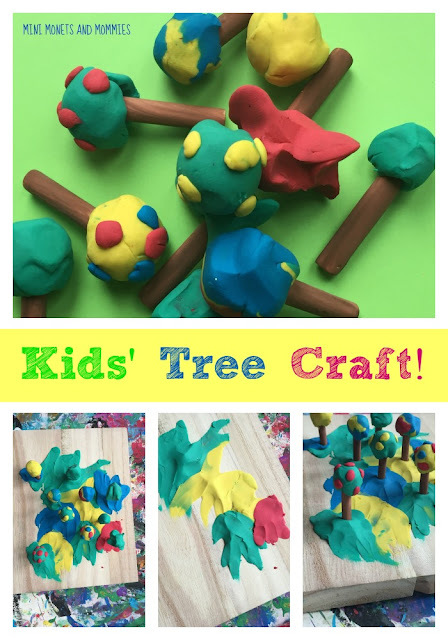 Sculpt tree tops. Ball up green clay (or a mix of colors). Press it onto the top of the peg. Your child needs to experiment with the weight of the clay in order to find out how much she can put on top of the peg. Add too much and it won’t be easy to anchor the peg into the clay base. Add too little and the tree may look somewhat sparse. Your child can also add on flowers or fruit using smaller pieces of clay. 4. Press the bottom of the peg tree trunk into the clay base. Repeat for other Tu B’Shevat trees. Let’s recap: What did your child just learn/develop? · Culture: The Jewish holiday Tu B’Shevat (the new year for trees). · Science: Biology (the growing cycle) and physics (the effect that gravity has on a weighty peg). If you’re reusing wood or cardboard, your child is also learning about the environment. 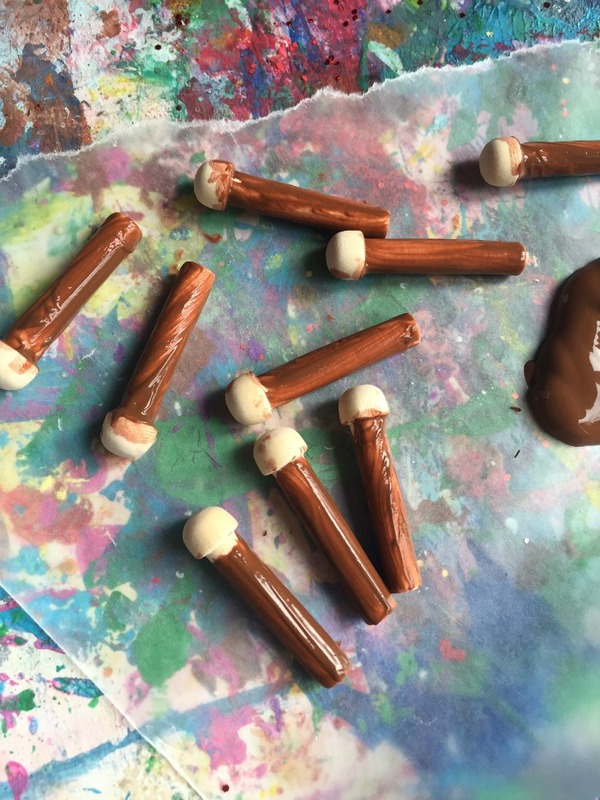 · Fine motor: Painting and playing with clay build dexterity and eye-hand coordination. · Art: Colors, shapes and exploring materials.